Photographs of a drop of alcohol hitting a smooth, dry, glass surface show the drop in the first frame just before impact. The next three frames in each row show the evolution of the drop after impact. In the top row, the drop splashes at atmospheric pressure, followed by the next three rows, which show the drops under decreasing air pressure. In the fourth row, at the lowest pressure, there is no splashing and no apparent undulations in the rim. University physicists have learned how to eliminate what scientists formerly regarded as the inevitable splashing that occurs after a liquid crashes onto a flat surface. It turns out that the removal of air eliminates the splash process. It was a case of not being able to see something because it was hidden in plain sight, like “The Purloined Letter” of Edgar Allan Poe, said Wendy Zhang, Assistant Professor in Physics and the College. “Things that are in front of you are hard to see because they’re around you all the time,” Zhang said. Lei Xu, a graduate student in Physics, reported the experimental findings on the physics of splashing at a recent meeting of the American Physical Society in Los Angeles. Zhang and Sidney Nagel, the Stein-Freiler Distinguished Service Professor in Physics and the College, are co-authors of the paper. The researchers say the discovery could lead to applications in technological situations where splashing occurs, including the combustion of liquid fuels, ink-jet printing and industrial washing. “In an engine you break the gasoline into millions of pieces and then ignite them in a chamber, making a controlled explosion. You do that continuously in your car,” Xu said. A higher gas pressure might do a better job of breaking the fuel into smaller, more uniform pieces. But determining that would require further experiments more accurately simulating the splash process as it occurs under fuel-combustion conditions, he said. Xu’s path to discovery began with an experiment designed to study energy distribution in the many pieces that fly away from a breaking droplet. The experiment showed that after a droplet hits a flat, dry surface, it forms a thin layer that breaks into thousands of pieces. Xu then repeated the experiment in a vacuum chamber and lowered the air pressure. He and Nagel figured that the drag of the surrounding air might play some role in the break-up process. Researchers in the field previously had seen no reason for low atmospheric pressure to affect the results of their splash experiments. “There are many people working on this because it’s a very important technological area,” Zhang said. “Up until Lei’s experiment, the idea in the field about splashing is that of course the air doesn’t do anything, because it’s less dense and less viscous than water,” she said. Instead, researchers generally focused on the interaction between the spreading droplet and the surface against which it collided. Their carefully controlled experiments produced reams of data but little understanding of the fundamental mechanism for splash formation. “One of the things that is notorious in the splash-study community is that it’s very difficult to reproduce somebody else’s experiment. People have been working on this for more than a hundred years, and it is only recently that we understand enough about the different factors that affect the splash process to be able to reproduce results,” Zhang said. The Chicago physicists isolated the effects of air pressure on splashing through a painstaking series of experiments involving four different gases and three different liquids. The gases selected—helium, air, krypton and sulfur hexafluoride—ranged from light to heavy. The fluids—methanol, ethanol and 2-propanol—have low surface tension, the force that makes a layer of liquid want to retract and form a droplet. Xu tested water splash as well. 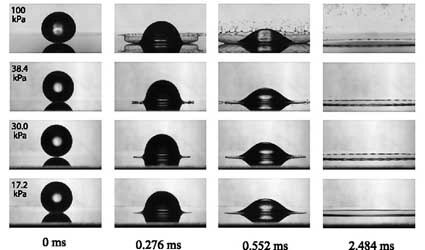 Water exhibits the same behavior, but its higher surface tension narrows the range of splash-forming impact velocity and creates a much larger margin for experimental error. “It’s much harder to splash than ethanol,” he said. Xu found that he could precisely control the amount of splash by tuning the pressure. The next step, he said, might be to investigate splash outcomes under experimental scenarios involving very large or very small drops, or drops traveling at higher velocities. Meanwhile, Nagel and his associates have completed another chapter in their ongoing research program that examines the surprising physics of everyday phenomena. “If you look at anything in nature a little more carefully, it yields new insights and new phenomena. It’s inexhaustible. You can never say you’re done,” Nagel said.